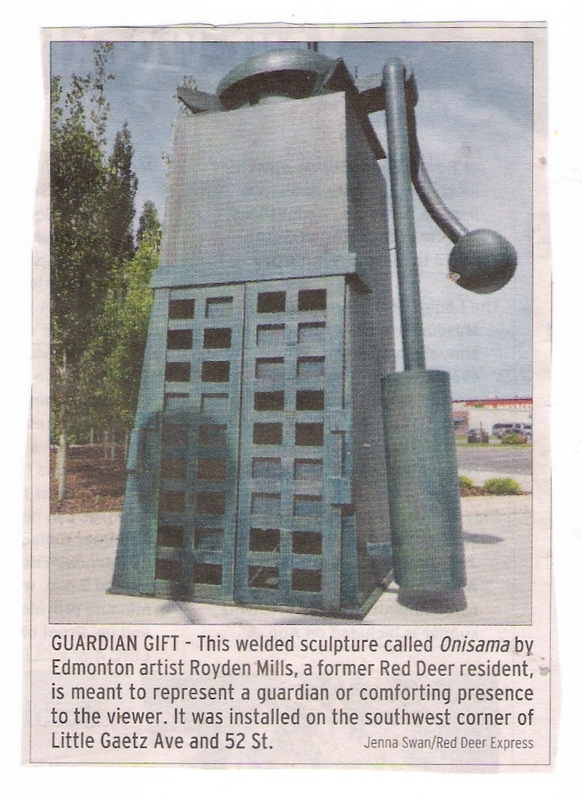 Red Deer Express, July 31st, 2013. A fabrication may be classified as ‘modern art’ when what it represents is not discernible. As indiscernible as this object is, we are told that it represents ‘a guardian or comforting presence.’ That we have to be told this confirms that the representation may not be discerned by a look. Who, not knowing what this object is given to represent, would guess that it represents something like comfort? The fact that one would have to guess is proof that its appearance represents nothing specific to reasonable persons. This object could represent a hundred things to a hundred lookers: an ancient telephone, a gas pump, a torture chamber, a gum ball machine, the entrance to a root cellar, and ninety-five other things chosen almost at random. Why comfort the hungry man by bringing him food? Why not just sit him down by the comforting Onisama instead? The claim that the object represents a great fruit that the practice of virtue produces (comfort) is an insult. Yes, the claim that one may be comforted by a hunk of metal whose form represents nothing distinct should be insulting to every thinking person. A piece of art, even poorly done, may communicate a sense of comfort so long as the object is discernible. A painting of a man rescuing a lamb, though poorly executed, might remind a Christian of the Shepherd of the sheep. That would be comforting. However, an object that looks like an invention by a mad scientist is not comforting at all, even after we are told that it should be. After looking at it, we have to declare that we feel nothing but cold indifference or even contempt from this hulking enigma. An object does not have to be formed according to an existing pattern in order to be art, though that is the safest, and Scriptural, rule. But it must at least be suggestive of something specific. Otherwise, it will appear, to reasonable eyes and minds, like a work of madness. A person might guess that this object is a stand-in for an ancient type of catapult. But it isn’t. And it can’t be shown to operate like one. “And he made in Jerusalem engines, invented by cunning men, to be on the towers and upon the bulwarks, to shoot arrows and great stones withal” (2 Chronicles 26.15.) If an object cannot pass for a work of art, then maybe it can pass for a cunning invention that can fulfill some purpose. But the Onisama is neither art nor a cunning invention. It is not made after a pattern and neither does it have a purpose. It can suggest nothing definite to anyone. And yet we are supposed to congratulate the maker of it, shake his hand instead of our head, buy his metal monstrosity, and place it in a public space as if everyone walking by it will be blessed by its comforting aura! Modern art is the outworking of the modern mind. The minds emerging out of our teaching institutions have been indoctrinated to dismiss or undervalue the principles of truth, beauty, and goodness. So, according to unprincipled modern art, you may have an object that points to no pattern for its source, that reflects no beauty, that is suggestive of nothing in particular, and that has no good purpose to exist. People will call the object a work of art and the maker of it an artist, even if the ‘sculpture’ consists of pieces of metal welded together in such a way as to perplex the onlooker instead of enlighten him. The Onisama is a dark piece of work that represents the darkness of an art world that is ages behind the darkest epochs of human history. Look at the drawings in catacombs, or those in caves from a distant stone age, and you will see art in greater advance than backwards modern art is. Great darkness has fallen, by degrees, upon our institutes of learning. This endarkening is increasing year by year. Before it was revealed to Abram that his people would, after many years of affliction, emerge from the darkness of Egypt, ‘an horror of great darkness fell upon him’ (Genesis 15.12.) Unless modern art becomes ‘an horror of great darkness’ to our teachers and artists, no long road toward light can be expected for the art world. An ever-deepening descent into darkness may be predicted if this horror does not fall from above. Abram’s people would not be released until the ‘iniquity of the Amorites’ was full (verse 16.) Many iniquities, I think, have yet to happen before our Western cup is full. Modern art represents a dark culture that cannot, and will not, see the light. Red Deer residents have been appealed to for ideas about what makes their city unique. We should address, first, what should not make Red Deer unique. We should not be unique by having too many ‘ghosts’ about town. Many of them have not the significant history required to justify their existence. The unqualified ghosts ought to be uplifted from their present haunts and repatriated to their originators. There is another way in which Red Deer should not be unique. The ‘Onisama’ sculpture is supposed to “represent a guardian or comforting presence.” It may be a comforting presence to the one who made it. But (with apologies to the builder) if a person were to look at it without knowing what it is meant to signify, would he find this piece of bulk comforting to the eye? It looks like an iron maiden, a slot machine, and a battleaxe, none of which conjure up comforting thoughts. Imagine breaking your leg beside this thing. Would you feel any comfort from its presence? It looks more like a torture device than a guardian. Many of us would like to see these modern art projects removed and then parked in the back yards of their builders. Many of these ‘ghosts,’ and probably all of these modern art pieces, make Red Deer appear corny and eccentric. Let’s not let Red Deer continue down this road of eccentric uniqueness. Let’s be unique in some other way.